As a kid, I was always more about the figures than the vehicles for the most part and that trend has continued through to the modern stuff. The vehicles just require a bit more space to display, and that’s something that’s still somewhat at a premium. I have gotten a lot of modern Alpha and Bravo class vehicles because they’re things I like and they’re usually a little bit more manageable size. Even if they’re not on display, it doesn’t take a lot of space to store them, so it’s no big deal. However, I generally still pass on the larger class vehicles. They’re usually not my cup of tea and their price point is a little bit out of my range. My opinion of large vehicles all changed when Hasbro released the 30th Anniversary Skystriker. Yes, it’s big…it takes up a lot of space on my computer desk, but man alive, it is also really cool. This is an incredible update and I appreciate that they also gave Ace a nice stylistic update to go along with it rather than just rehashing his original test pilot flight suit look (which I’ve honestly never been a fan of). 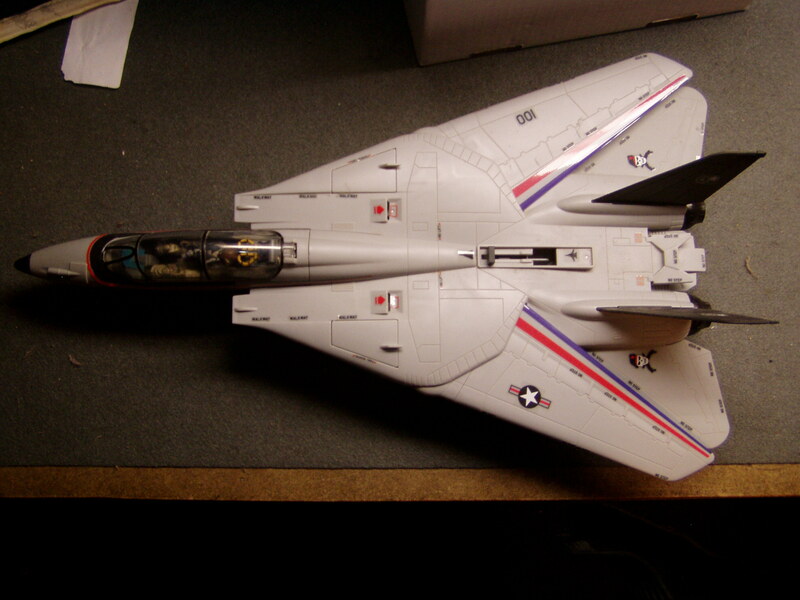 The Skystriker was technically first released as the SDCC exclusive Cobra Commander and Starscream set. I really liked the design they used for Cobra Commander there and surprisingly, aside from his head, Ace uses the exact same parts. 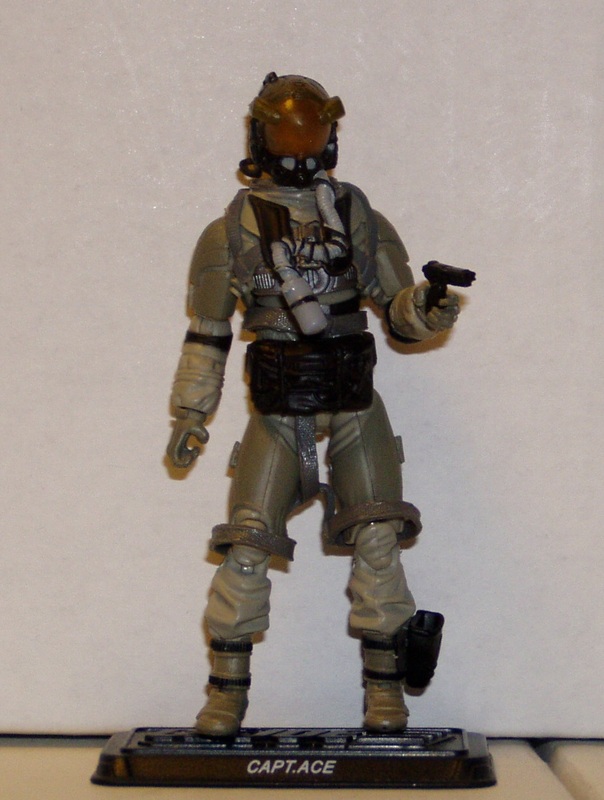 It’s a neat take on a more modern flight suit and it looks good despite being nothing but reused parts. 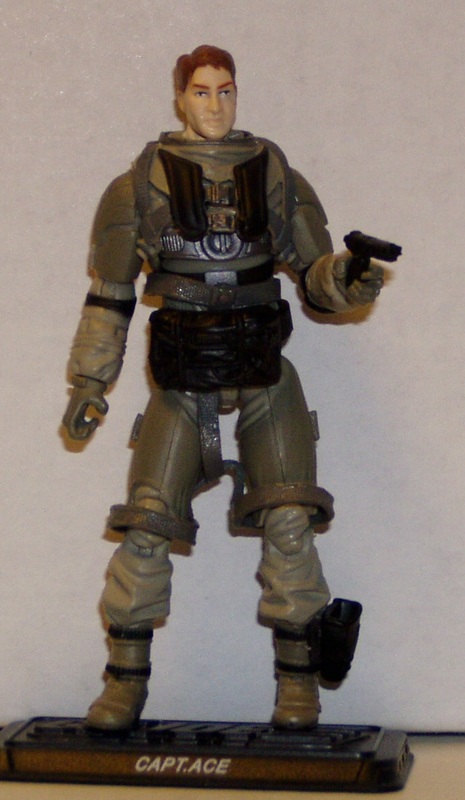 The torso comes from the first Resolute Box Set Duke (the funky jetpack Duke), his thighs and head come from the 25th Anniversary Ace and his arms and lower legs come from Pursuit of Cobra Skydive. 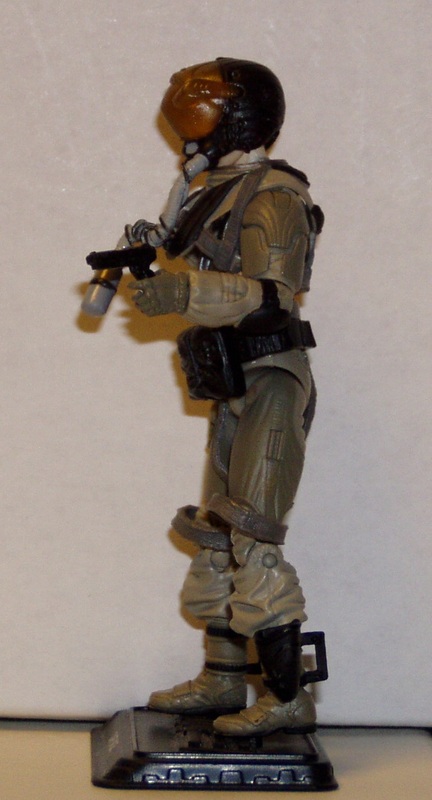 The Resolute Jet Pack Duke torso is a good one to use for a jet pilot. They used it for Rise of Cobra Air Raid and it worked well there, so why mess with something that works? It’s got a nice hightech vibe to it and I can see it being part of the interface with his fighter jet. 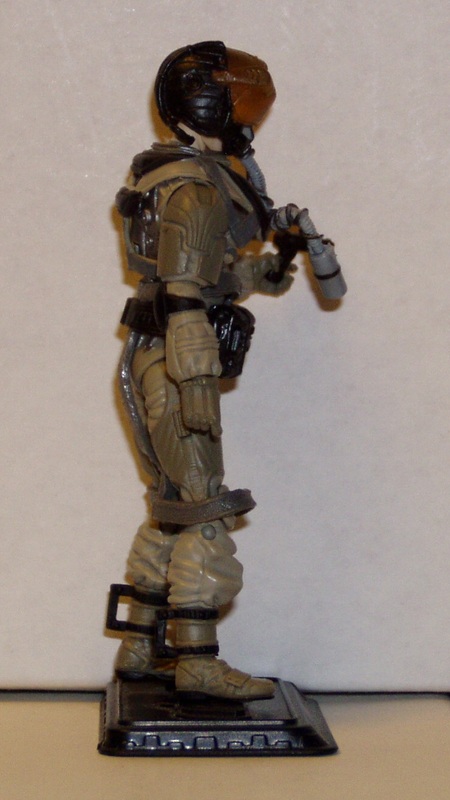 The arms and legs also work well as part of a next-generation flight suit. While I’m not sure the armor is quite as necessary for a fighter jockey as it would be for a jetpack trooper, it still fits together with the overall look. The few original Ace parts are used rather well. Ace looked a bit dated even when he was first released and that was a bit problematic, but pairing his old upper legs with the newer lower legs makes them work a bit better for me for some reason. His head sculpt also seems a bit sharper. I think the 25th Anniversary Ace head sculpt suffered a bit from some paint issues. The skintone color paint was just too thickly applied and the figure consequently looked a little underdetailed. This time around, the head appears to be molded in fleshtone plastic and it really does do wonders in terms of letting the sculpt shine through. I wasn’t totally sure this was even the same head sculpt until I checked YoJoe to make sure I was listing his parts properly. It’s amazing what a simple change in paint can do. Over all of this, Ace is wearing a lot of extra gear. He gets the 25th Ace’s chest harness, the 25th Airborne’s leg harness and 25th Snow Serpent’s parachute pack. 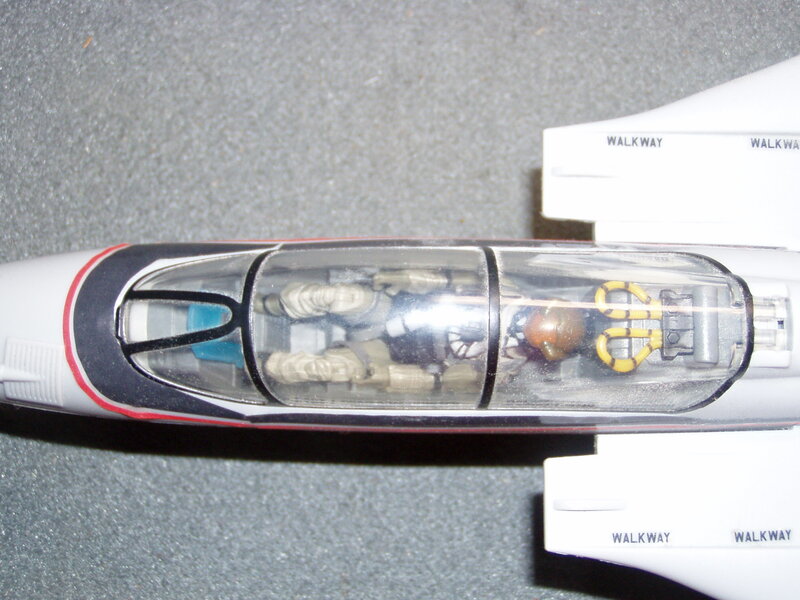 While I do find it just a little too busy at times, the added harnesses and belts are appropriate for a fighter pilot, though I would have thought that in a jet as advanced as the Skystriker, the parachute would be built into the ejector seat and he wouldn’t need to wear a parachute on himself as well, though I can see him wanting a back up chute just in case the ejector seat gets damaged on the way out and can’t deploy its chute. The pieces work well together and help disguise the parts reuse a bit more. The leg harness does restrict his leg articulation a little and you have to adjust it a bit to get him into the cockpit, but it’s not like he can’t fit into his vehicle, so it’s not that big of a deal (though it took me a little bit to figure out how to get him back in the cockpit after I pulled him out of the seat when I was reviewing him). To help complete the high-tech fighter pilot look, Ace also gets a brand new helmet. I really like this design. It’s futuristic yet at the same time is close enough to modern helmet styling that it doesn’t seem too out there. There’s a definite astronaut vibe to it with the amber visor, but it’s clear that it’s got a lot more going on than that. The additional tech details on the visor itself and on the back of the helmet really make it feel pretty cutting-edge. In the event that Ace has to bail out of the Skystriker, the helmet has a small oxygen supply attached to the front of it, much like Renegades Ripcord’s jump helmet. 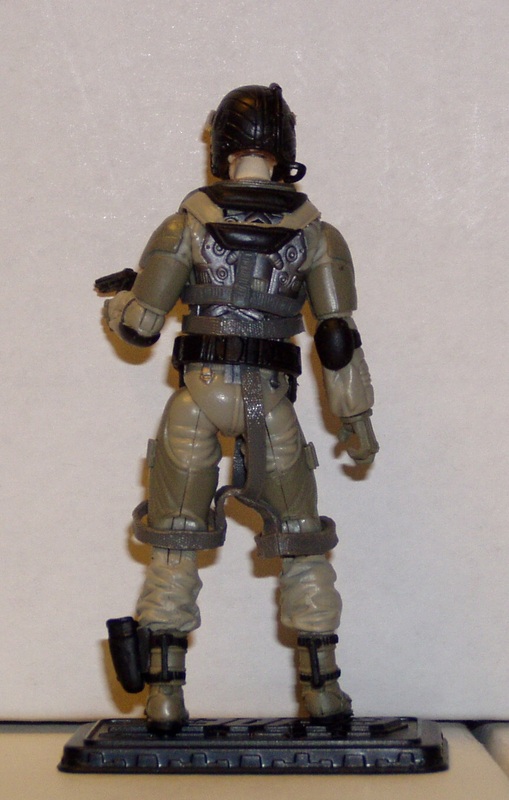 Capping off the accessories, Ace also gets a small pistol to fill his leg holster. It’s not anything groundbreaking, but I’m glad they decided to fill his holster instead of leaving it empty. Again, should Ace wind up bailing out in enemy territory, he’d at least have something to fight off Cobras with until he could pick up something a little more substantial. Ace’s color scheme is relatively bland, but it still looks great and I think the best part is how well his colors mesh with some of the other recent Joe airborne operators. Ace’s flight suit is a light tan with some dark tan detailing over top of it. This color scheme is pretty similar to both Retaliation Airborne and Updraft (Retaliation Lift Ticket). The Joe team’s pilots have always been a pretty eclectically colored and outfitted bunch. Now, however the team’s premiere pilots and second seat all actually look like they belong in the same unit together and I appreciate that. The only Ace I had experience with growing up was my brother’s first version from a Hasbro mail-away and I’d never really liked Ace all that because of it. The space suit look was just a little too weird for me. I’d always preferred the more realistic pilots like Lift Ticket and the Cobra Aero Viper. The 30th Anniversary Ace fits in very well with the modern aesthetic and while I know a lot of people have complained that the Joes are getting a little too realistic looking and come across as kind of boring, I think there’s still enough futuristic flair to 30th Anniversary Ace to keep him interesting. You’re not going to be mistaking him for a modern day fighter pilot for a wide variety of reasons but when you have him hanging out with Airborne and Updraft, you can tell at a pretty quick glance that these guys are all supposed to be pilots for the same unit. Of course, the best Ace figure ever made isn’t going to get much attention if his ride is lame (1993 Ghoststriker X-16 Ace, I’m looking at you). An updated Skystriker already had a lot to live up to because it was such an iconic vehicle. Add in the fact that it’s one of the few larger scale vehicles that’s been released since the line restarted and the expectations for it are pretty high. Thankfully, Hasbro didn’t disappoint here. They really knocked the Skystriker out of the park. Both KansasBrother and I were a little young to have owned the original Skystriker, so I have no historical reference point, so my first impressions are this is a solidly built and well designed toy. However, calling it a toy really does to it a disservice. As I was getting ready to photograph it for this review, I was once again impressed by the level of detailing they managed to cram into this piece. While I’m not a model builder, this strikes me as on par with model kits in terms of detailing only with the added benefit of it being a little less fragile. In terms of assembly, there really wasn’t much to do. Attach the cockpit, attach the wings, attach the tailfins, attach the engines and put the canopy on the cockpit and the Skystriker is ready for battle. It’s a nice, simple build, but it was still enough of a build that I was able to wax nostalgic about assembling Joe vehicles back in the day. I’m sure it was a lot simpler than the original Skystriker, but it still made me appreciate it more than I would have had it just come out of the box fully assembled. Hasbro did a really great job of replicating a modern fighter jet while not aping any one specific design and really making it their own. At just a quick glance, you know it’s a fighter jet and if you’re a Joe fan, you’re not going to be mistaking this for any other Joe vehicle. The Skystriker was always pretty iconic since it showed up in the cartoon piloted by just about every Joe imaginable. Heck, a friend of mine in grad school who was also a Joe fan joked with me that I should write a paper about the role of air power in pop culture using G.I. Joe as a basis so I could write off Joe Con 2009 as a “research trip” and of course, the Skystriker was a central point of our discussion. The design is great and they did a great job of updating it for the mmodern era. I only have two real complaints, once of which is silly and the other is a little more serious. On the silly side, I think the attachment points for the bombs are just a little too short (or the sockets on the bombs especially are too shallow, I can’t really tell which). As such, they don’t really stay on that well. I’ve accidentally called in an airstrike on my printer a couple of times after I’ve cracked my knee into my desk and knocked the bombs loose. From what I understand from other reviews, Skystrikers from later in the production cycle had slightly redesigned attachment points so they were a little more secure. It’s not a deal-breaker by any means, but I was awfully nervous about transporting it to grab pictures of it for fear that a bomb would drop off and skitter someplace unreachable. On the more serious side, I do wish that they could have reworked the swept-wing mechanism a little bit. I understand that when a jet’s wings are swept back, it’s in flight and when they’re out straight it’s landed, but from a display side, I wish I could have the landing gear down but the wings swept back just to decrease its overall footprint on my desk just a little bit. Displaying difficulties are a major reason that I don’t often bite on larger vehicles and honestly, if it weren’t for the fact that I own a printer-scanner-copier that I really don’t use as either a scanner or a copier, I don’t know if I’d have any place with enough space to actually display this, especially with its wings out straight. The cockpit is exceptionally well-detailed. I like the heads-up display inside and there are a lot of additional details that I’m not actually sure what their real-world purpose is, but I’ve seen enough pictures of fighter jet cockpits to know that they’re there in the real world as well. The cockpit has also been a bit of a bone of contention. The Skystriker has always been a twoseater. 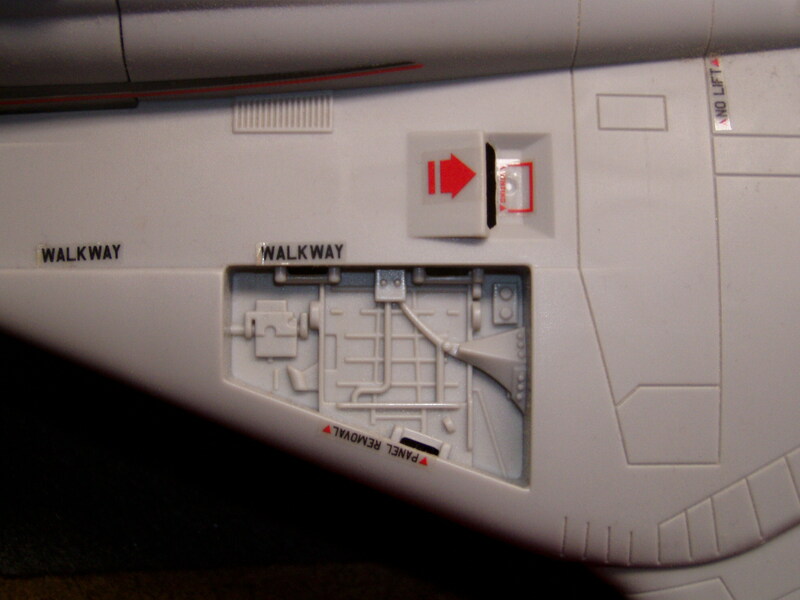 Even the sticker sheet showed you how to have two names listed on the side of the canopy as a way to customize your Skystriker. Yet, strangely, the cockpit is only designed to seat one Joe. To be honest, I’m okay with it being a one-seater since I’m concerned that the overall look of the vehicle would get thrown off since the cockpit liked would have needed to be longer to accommodate a second figure, but I do agree it would have been just a little more amazing had the Skystriker been a two-seater. As it stands, I’m not going to lose any sleep over it, but at the same time, gosh, it would have been nice. The paint job and stickers are great. First of all, there are a lot of stickers and that makes me smile. I have a lot of fond memories of placing stickers on Joe vehicles and it was nice to get to do that again on something this size. There are three different places they gave you the ability to customize your Skystriker. I’ve already mentioned the cockpit, but the other two are a bit more noticeable. The stripes on the nosecone and wings could either be done in the traditional red and blue colors or in a black and gold color scheme. I’m not sure where the black and gold came from but it does look rather sharp. It wasn’t enough to overwhelm my desire to use the classic Skystriker colors, but it’s still nice to have the option. The other place for customization was on the tailfin decal. 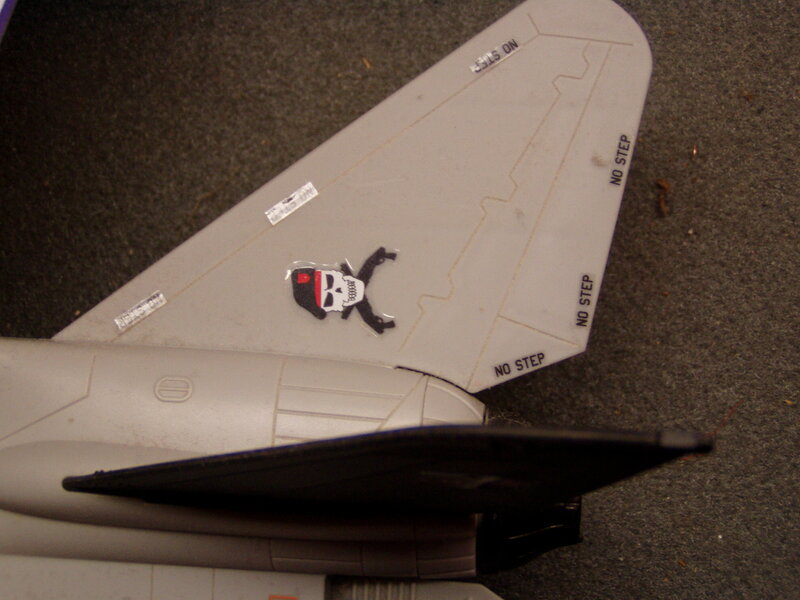 In addition to the classic Skystriker logo, you could also put pilot specific logos for Snake Eyes (a pair of dice showing snake eyes and the Arashikage symbol), Flint (a skull wearing a beret with a pair of crossed shotguns behind it), Shipwreck (a killer whale similar to his tattoo), and Ace himself (a royal flush poker hand with “Aces High” written alongside). The logos are all very cool and I’ll be honest, I liked the Flint logo so much I felt like calling an audible on the play and decided to throw those on the back fins as well. The Skystriker logo is classic and iconic and it looks great on the black tailfins but since I could make Flint second seat on the cockpit, I thought it would be nice to put his logo on the tail of the plane as well. Is it realistic, no? But is it cool, yeah, I think so. The Skystriker itself is painted in a very light gray. It’s a good color, but I do wish it had been done up in the cartoon white just because that’s how I was always exposed to it. Gray is more realistic and it is light enough it can pass, but I think a crisp white Skystriker would look even more striking. That said, I do like that they decided to make the vertical tailfins black as opposed to the same color as the rest of the body like it was back in the day. It makes them stand out a little bit more and it helps break up what’s otherwise a pretty basic color scheme. Since the end of Rise of Cobra, the Joe line really hasn’t focused too much on vehicles. However, what larger vehicles they’ve done have always been well done. Even with its built-in action feature, the Rise of Cobra Night Raven is a fun piece but still has enough nods to the original vehicle to please us old-school Joe fans. The Skystriker, however, is a love letter from Hasbro to its old school fans all the way. It’s an amazingly faithful reproduction of the most iconic airplane in the entire Joe line. It looks great, it’s designed very well and even its pilot looks incredible. 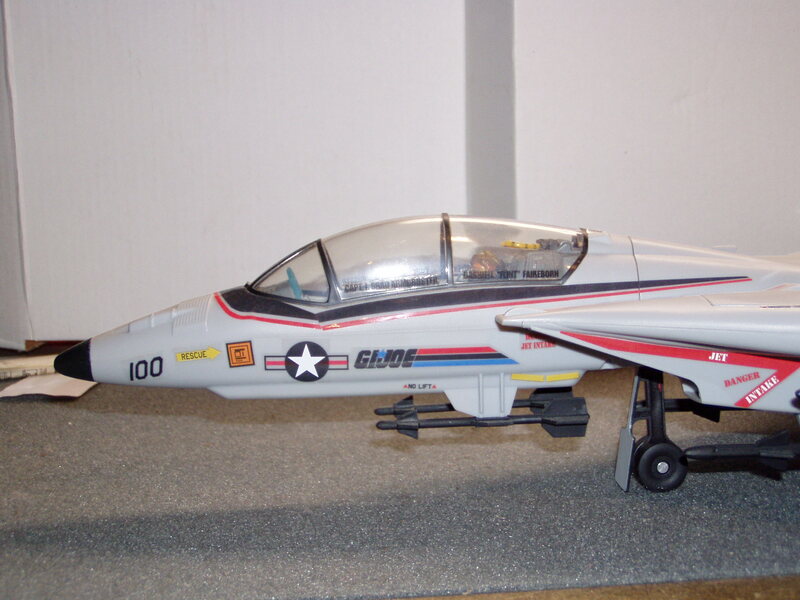 I was more about the ground vehicles as a kid, but I’ll tell you this, if I was a young Joe fan now, I’m sure the Skystriker would have been one of my favorite vehicles and I would have gone out of my way to find a way to incorporate a fighter jet into as many of my adventures as possible. Even though its bombs can be a little twitchy, it’s still incredibly playable. I love that there’s enough undetailed space at the back of the plane between the engines that you can securely hold it, yet put it through high-speed turns and dives (not that I did that after I bought it and put it together or anything since I’m an adult and don’t play with my toys, right…;)). It may be oriented towards us older Joe fans, but they still really did manageto recapture the fun factor that a lot of the old Joe vehicles had. I seriously have trouble picking it up even just to move it and not do a quick banking turn on the way to wherever I need to set it for a few minutes. It’s a great update of a classic part of the Joe brand and after the Tomahawk came out under the Retaliation banner even after the Joe team said in 2009 that wasn’t a possibility, I’m filled with a lot of hope for some other great nods to Joe history in the form of larger-scale vehicles that the fans were often told “weren’t feasible” to do anymore. I’m not holding out for a Terrordrome playset or anything since I think the days of action figure playsets are pretty much over, but there are still some classic larger Joe and Cobra vehicles just screaming for an update. Considering how quickly both this and the Tomahawk moved at retail, I think there’s clearly a market for it and Hasbro has definitely shown they still know how to bring the thunder on their large vehicles. The original Skystriker was the first large toy that I saved up my allowance for weeks to get. We did a trip in to Edmonton (a two hour drive from my small town) and stopped at one of the two malls we frequented while on trips to the city. I ran to the toy dept of the Sears and scoured the shelves until I found the Joe aisle and there it was. You can imagine my 10 year old surprise and amazement when I read Ace’s file card the first time and discovered we had the same last name! For some reason, he’s still my favourite Joe! I have a similar fascination with Cutter for a similar reason–he and I share a birthplace. I had the DEF Cutter as a kid and got him because he looked pretty cool (and I think I’ve always always had a thing for grappling hook launchers) and when I read his filecard I was amazed to discover the name of the quite small town in Kansas I was born in as his listed birthplace as well.